Heat packs (also called "kairo" in Japanese) are a very popular item in Japan during the colder months. There are many different types of heat packs. 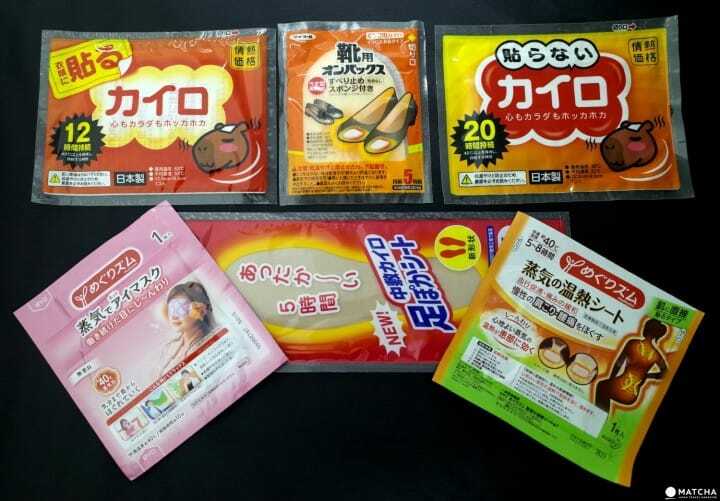 This article introduces you to five different types of Japanese heat packs and their use. Winter in Japan is a season with so many great attractions such as snow onsen, skiing, illuminations or winter festivals such as the Sapporo Snow Festival. In spite of what you might imagine, the Japanese winter can be very harsh and cold. You might be wondering how to stay warm when you are out and about. Japan has a very nifty solution for this problem: heat packs! What are Japanese Heat Packs? You might know the pocket warmer you can stick in your pockets to keep your hands warm. Most of them are microwavable. Japanese heat packs, also known as kairo in Japanese, are very similar to that. The only difference is that they are self-heating and one-time use only. Another difference is that there are many different types of heat packs, not only the one that warms up your hands. One very important word to look out for when you choose your heat pack is the word "haru" (written 貼る or はる), which means "to stick to" in English. If you want the sticky type of heat pack which you can stick to your clothes, you need to search for the "haru" type. Some of the sticky heat packs also feature an image that resembles peeling off a sticker. If you want the normal pocket warmer you need to look for not sticky, "haranai" in Japanese (written 貼らない or はらない). How to Use Japanese Heat Packs? Even though the styles differ, most heat packs work the same way. Pressure and air trigger a chemical reaction with the iron sand that they contain making them heat up. Once you take the heat pack out of the package, you should play with it for a little bit. Rub it together or squeeze it. You should feel it heating up after a short time. Now it's ready to use. No need to worry, though, heat packs never become burning hot. Most of them heat up to a comfortable temperature of about 40 degrees Celsius. Introduced below are five types of Japanese heat packs you might want to try for yourself. The non-sticky pocket heater is the traditional type. It's like a little pillow which is meant to keep your hands warm. You activate it and stick it into your pockets or hold it in your hands. It is especially useful if you don't have gloves. The pocket heater is also available in a mini version (written ミニ). The mini pocket heater is about half the size of the original. Some people like to use the stick type minis into their gloves or socks to keep their hands and feet warm. The normal size pack stays warm for up to 20 hours, while the minis only up to 10 hours. As mentioned before, there is a sticky version of the common heat pack as well. Search for the "haru" on the package. You can peel off the seal on the back and stick them anywhere on your clothes. They are great for keeping warm as well as treating any kind of minor aches. Please refrain from applying them directly to your skin! They are not made for direct skin contact. The sticky side gets very hot. The glue can cause allergic reactions when applied directly to the skin. However, if you use them as intended they are extremely useful. Some people like to cover themselves with them if they are out and about in winter. The sticky type of heat packs stays heated for up to 12 hours. Japan has a couple of variations available to solve this problem. The first variation is a sticky heat pack meant for your socks. Some people like to stick them on the top of their sock instead of the bottom because they can feel hot when you step on them. As with the other sticky heat packs, please don't apply them directly on your skin. The other type is a heat pack you stick into your shoes. These are available as half insoles and full insoles. The bottom of them is covered with a non-slip material like foam or rubber and the top is the heat pack. The half insoles just keep your toes warm, while the full insoles heat up over the whole length. The sock and the shoe heat packs are easy to tell apart. One has socks on the package, the other showcases shoes. Most of these heat packs stay hot for up to 5 hours. Medical heat packs are made to be directly applied to the skin. They are perfect to ease backaches or muscle aches with heat. They don't contain medicine, so they can also be used to stay warm. Even though they also supposedly heat up to 40 degrees Celsius, they don't get as hot as the other heat packs. They stay warm for 5 to 8 hours. The heated eye mask is made for tired eyes. You can use it anywhere you want to relax. Of course, using it at night is one option. However, it's also perfect for when you travel. You can use it in the train, in a highway bus or in the airplane. You will wake up refreshed and your eyes will feel relaxed. The mask heats up for 10 minutes but will keep its heat for quite a while. There are so many types of hot packs to choose from. They all serve a different purpose and it's hard to pick a favorite. We're pretty sure you'll find them useful. How about trying some this winter and decide for yourself which one will become your go-to heat pack? The Sapporo Snow Festival 2018, An Extravaganza Of Snow And Ice!